BMW has just taken the wraps off its new 5-series GT, which goes on sale early next year and shares its design with the next-generation 5-series sedan also due next year. If the vehicle proves popular, a smaller version based on the next-generation 3-series sedan is expected to be launched in 2011. Picking up the 3-series GT moniker, the car will feature the same raised seating position and ride height as the bigger 5-series GT and will also likely adopt a two-tier rear hatch design. It will come with both RWD and xDrive AWD configurations, with power coming from a range of four and six cylinder engines. The computer generated rendering above gives us a preview of what the new car may look like, revealing that it will share the aggressive new look that’s being implemented across BMW’s lineup. Designers will be stressing the car’s coupe characteristics just as they did with the X6 and new 5-series GT. Expect to see extremely short overhangs, pumped fenders and sporty alloy wheels. 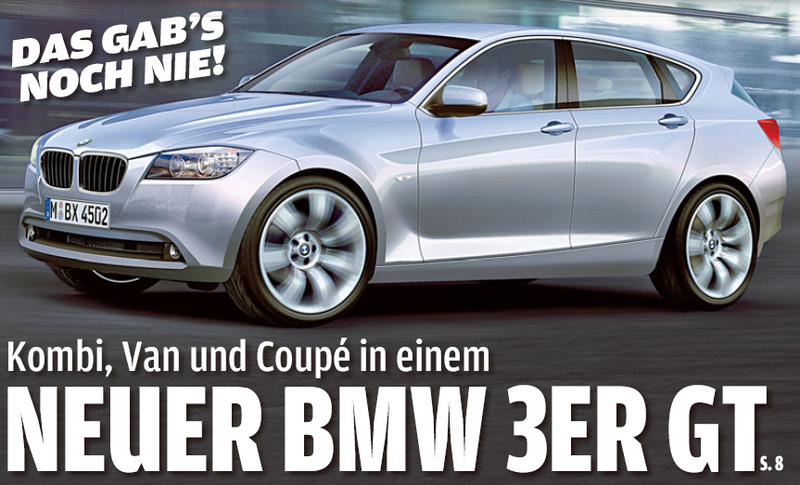 Pricing will also reflect the car’s positioning above the standard 3-series on which it will be based. Along with an upcoming replacement for the X3, it will give BMW a vital rival to Audi’s A4 Avant as well as the upcoming Q3 SUV. BMW the next GM. Trying to make all cars for all people no matter how few. imho... they are spreading themselves to thin. The GT line has absolutely no visual appeal to me. I lump them in with dodge caliber, toyota matrix, and the like. IMO they aren't a meat and potatoes car company, that is what Ford and Toyota are for. BMW has to constantly find new niches, or they will die. They aren't a low cost producer, so they have to innovate. They have recognized that people like the utility of a hatch and an upright driving position (ref X3, X5) but that many people reject the touring versions outside of Europe because they are associated with traditional US station wagons. We really don't need 1000 lbs of additional road-hugging weight, lower fuel economy, and so on, but want something different than a sedan. Personally, I really like the GT concepts (I refuse to call it a PAS or PAC or whatever else it has been coined for the same reasons I didn't call my X5 an SAV). The more vertical grills are coming on all models due to pedestrian impact legislation, and that is half of the pushback on the 3 GT and 5 GT it appears. I like the idea of a 5 GT, but it is too big for what I need. A 3 GT makes more sense in my case.